Browse: Home /	Public Places, Street Gardening, Sustainable Flatbush News, URBAN FARM & GARDEN / Street Tree Walking Tour on Sunday 10/24/2010! 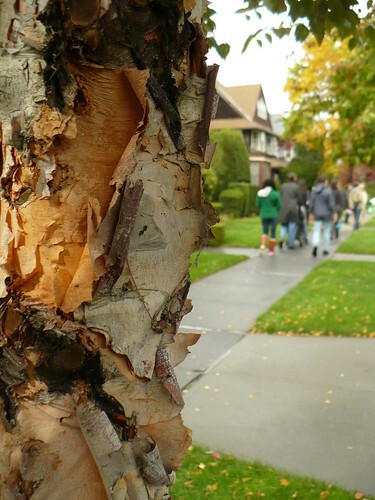 After the success of last year’s fall walking tour, this Sunday, October 24th, Sustainable Flatbush will be holding our 2nd Annual Fall Street Tree Walking Tour! This year it has even been listed as a NeighborWoods Month event! The tour will take advantage of the colorful fall foliage in the backdrop of the beautifully picturesque Victorian section of Flatbush. The rich history of this area includes the trees, some of which are more than a century old. These natural landmarks dot the Flatbush area, and are an important aspect of the Victorian charm here. The tours will leave at both 11 AM and noon that day from the Sacred Vibes Apothecary on Argyle Road, and will be led by our two expert tour guides, Sam Bishop of Trees NY and Sustainable Flatbush’s own Chris Kreussling (aka Flatbush Gardener). They will share some interesting details and facts about the trees of the area, the different types of trees and their characteristics, and the benefits of having trees in the context of urban areas. So whether you are interested in learning more about the flora of the area, or you just want to admire the beautiful sights to be seen during this time of year, this Sunday is sure to be a great experience!